On Saturday, June 7th, Grassroot Soccer (GRS) Zimbabwe launched our innovative HIV prevention programs to be operated out of the FIFA Football for Hope Centre in Bulawayo. 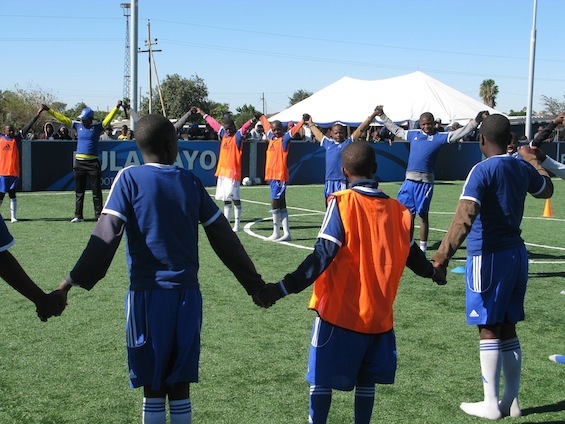 Zimbabwe is the birthplace of Grassroot Soccer, and GRS Zimbabwe has spent more than a decade utilizing professional soccer players to have a positive impact on the lives of at-risk youth. Now, at the heart of the city where GRS was born, rests a FIFA Football for Hope Centre (FFHC) dedicated to providing education and public health services. Played on by budding soccer stars and professional player/role models, this pitch will be a vibrant and sustainable development hub and serve as an effective platform for driving positive change in the community. 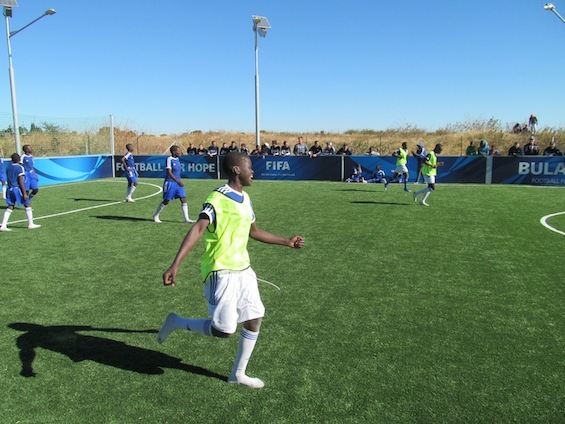 The Centre is part of FIFA’s ‘20 Centres for 2010‘ campaign which, in partnership with streetfootballworld, has created 20 Football for Hope Centres to promote public health, education, and football for young people in disadvantaged communities across Africa. GRS manages three of the Centres, including two in South Africa (Alexandra and Khayelitsha). GRS participants engage in a GRS SKILLZ activity at the new Centre. Founded by former players of Highlanders FC, GRS has become an international soccer movement. 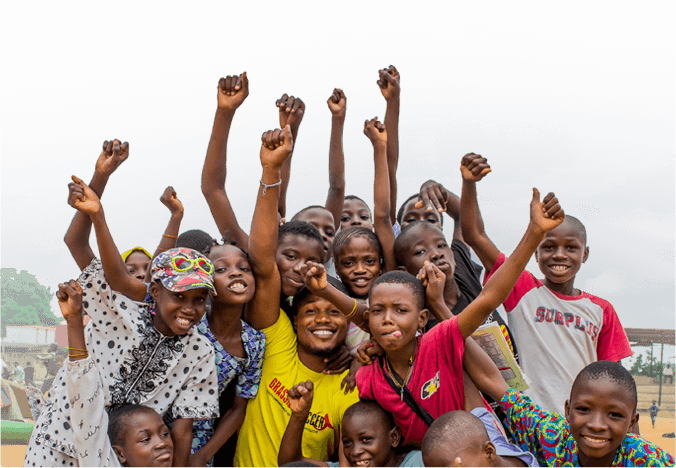 Over 685,000 young people have been empowered with HIV education and life skills across 34 countries.The formula is simple: combine a game the world is passionate about, role models who are experts at connecting with youth, and a curriculum informed by current research and thorough monitoring. The Football for Hope Centre is where this mixture comes to life. It provides a safe space for young Zimbabweans to play and learn and holds the promise of a healthy and productive life. GRS Co-founder and Zimbabwe Managing Director Methembe Ndlovu speaks at the program launch. Guests on hand for the program launch included members of GRS’s Global Board of Directors, as well as the University of Notre Dame’s men’s soccer team. The team is visiting Zimbabwe, playing matches against local teams, training with the Bantu Rovers (who are also GRS Coaches), and volunteering with GRS. The world of GRS came full circle on Saturday, as Notre Dame head coach Bobby Clark, father of GRS CEO and Founder Dr. Tommy Clark, former coach of Highlanders FC, and former Dartmouth College coach of both Dr. Clark and Methembe Ndlovu, was on hand to distribute medals to the winning team in a friendly match between GRS participants. 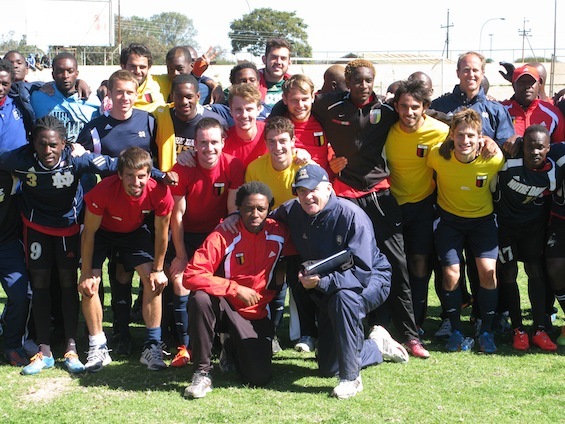 Members of the Bantu Rovers and the University of Notre Dame's squads at the program launch. In front are Methembe Ndlovu and Coach Bobby Clark. 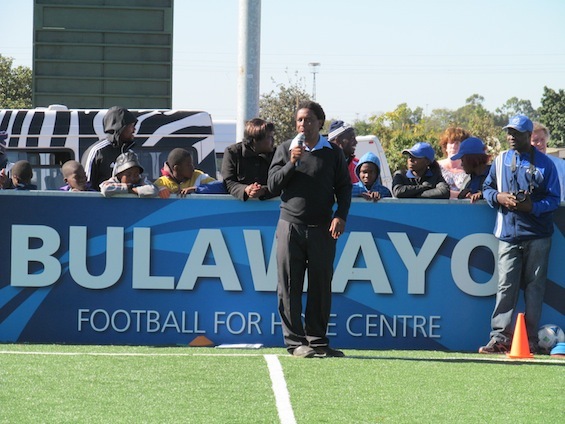 Grassroot Soccer Zimbabwe is intertwined with the local and national soccer communities and will be the driving force behind the impact of the Bulawayo FFHC. From the Centre, GRS will deliver its innovative programs and services to our main beneficiaries: young members of the Bulawayo community. Portland Barefoot World Soccer Festival Breaks Tournament Record in Support of GRS!